24.8 hrs last 2 weeks. I can't verify my mumble. When i press the verify me button it says to try again later or contact an admin. for some reason everyone in #307335 got banned for not being in mumble after the lobby closed despite everyone being in mumble throughout. 215.9 hrs last 2 weeks. Hello, when I played several lobbies today I was banned from tf2 centre lobbies because it claimed I wasn't in mumble in a mumble required lobby. I have now been banned 3 times today because of a bug where I was banned for not having mumble when I was in the mumble and with a headset. I am wondering If this problem could be fixed and If the ban can be lifted, ASAP. I am currently banned until 10:24. 94.1 hrs last 2 weeks. this is getting dumb, fix the code or get rid of the feature people are leaving the site since it's broke. (or at least having bad experiences) If you need help with the feature just PM me i'll fix the doc. At the very least remove the feature till it's dealt with. Edited by Vash, 18 January 2015 - 06:37 PM. 84.3 hrs last 2 weeks. Would appreciate it if you can clear this ban, as I was 100% in mumble the entire time when I joined as a sub. This is the first time in a couple months that I've gotten a bad mumble ban. In the past it happened once. I join mumble 100% of mumble required lobbies, and 90% for non-mumble required ones. 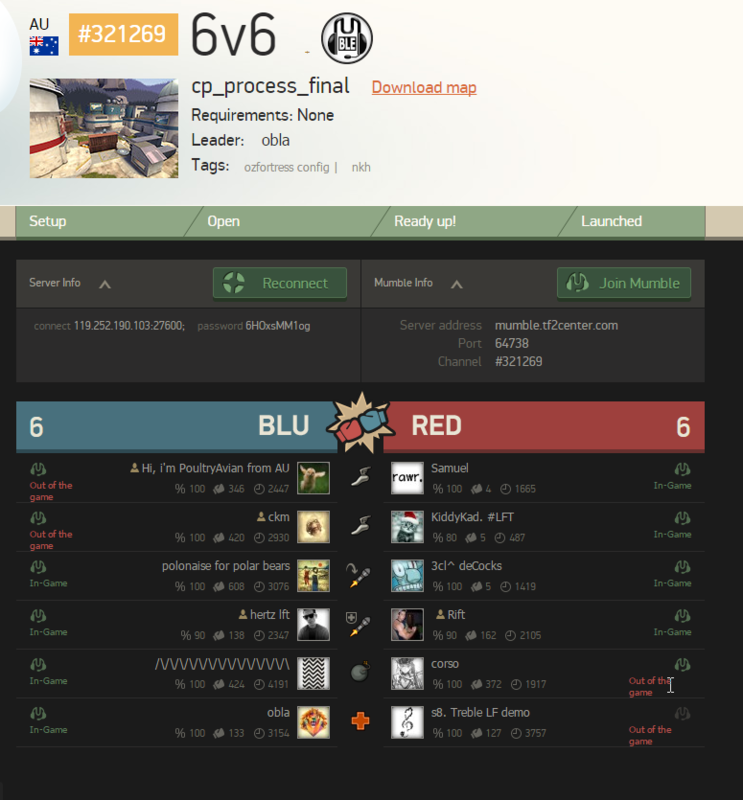 I 100% joined mumble, and I remember some aussie sounding guy talking. But the game only lasted 2-3 minutes (the team was down 4-0 when I joined) minutes and I left promptly when the game was over. Edited by slayer, 19 January 2015 - 04:17 AM. 16.1 hrs last 2 weeks. I know for a fact naknak makes it to mumble every lobby. somethin's going on. 112.8 hrs last 2 weeks. Happened to me just now as well. 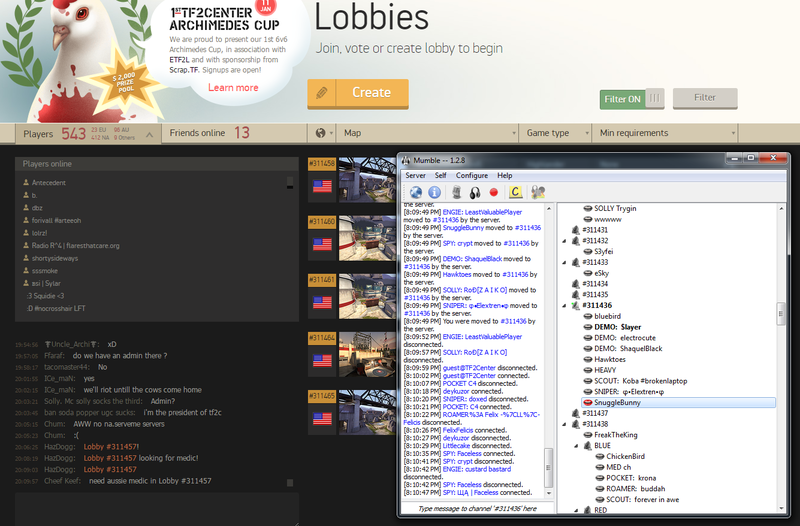 I've never played a lobby without being in Mumble. 37.7 hrs last 2 weeks. I hope this information will help you iron out any bugs in this ever improving system. Let me know if there is any other information you need from me. This is the official response. Should be good now. Just restarted TF2C due to a hanging thread that handles Mumbility. Players played during 26th Jan 20.00 until 23:15 were punished unjustified. Not going to dig into DB and reverting that; I assume it will fix itself over time. 42.6 hrs last 2 weeks. I've gotten two mumble bans in recent days for lobbies I know I've been in. I join the tf2center mumble manually from my mumble favorites list, rather than going through the auto mumble launcher. I don't know when this was implented but it's pretty stupid that you get mumble banned for choosing not to deal with the terrible auto-join. I don't know when this was implented but it's pretty stupid that you get mumble banned for choosing not to deal with the terrible auto-join. I have 0 Mumbility points and it's very strange, cos I'm playing with mumble. How can I fix it? 54.3 hrs last 2 weeks. Here's evidence of the remaining people. Edited by obla, 31 January 2015 - 05:36 AM. Don't use proxies; this will cause Chrome/FF to have a different IP than Mumble, and therefore TF2c cannot do the matching. Not using proxies. Some_Thing fixed it up yesterday, cheers for your help! 65.4 hrs last 2 weeks. The remote host keeps closing the connection for me as if I am banned, but I have 0 mumbility and have yet to play a lobby that I wasn't in the mumble, until recently because I can't join it.